It brings the story of the rock lighthouse completely up-to-date – from the day the first granite block was laid, through construction, automation, the disappearance of the lighthouse keeper, right up to the technology of today with the use of solar and wind power. 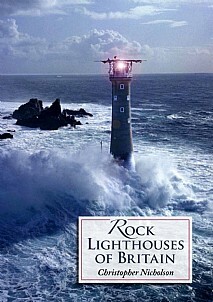 This is a joy to read with its mix of exciting text, some of the most dramatic new colour photographs of British lighthouses ever taken, a selection of beautiful, hand-coloured plans and drawings, a brand new chapter about Rockall, the most unusual rock ‘lighthouse’ of all, and a detailed appendix. This handsome book remains an essential part of any lighthouse or maritime enthusiast’s library and will also be of huge appeal to anyone interested in maritime/British history or looking for an enthralling read.